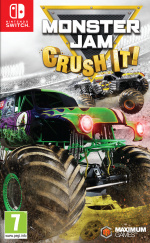 During the Summer we shared the news that Monster Jam: Crush It! is heading to the Switch, and now the eShop pages (via the ever reliable 'Coming Soon' section) has backed up online retail listings to pin down a release date - 31st October. Yep, we reckon they're trying to be a bit clever with that release date. It's worth remembering it's a retail game (which had a mixed critical reception for its PS4 / Xbox One versions in 2016), so it has a budget retail price. It'll be $39.99USD in North America and £34.99 on the UK store, as two examples. A quick look online shows the same price for the boxed version on Amazon.com, but a more palatable £23.99 (at the time of writing) on Amazon UK. That UK listing gives a date of 14th November, however, so there's clearly a bit of a delay for the cartridge in some territories. For those that like over-sized vehicles and crushing things, it might be quite tempting. It good in some sections but bad in others. Big difference between the UK digital and retail prices. And a retail copy is always better. It can be bought for at least £7 cheaper again on PS4 and XB1. Gameplay video of the Switch version looks terrible. Just as terrible as all the other versions. With Troll and I already released and Battle Crashers on the way, Maximum Games does everything quite well to be recognized as the first true shovelware retail manufacturer for Switch. This game is awful, all the races,hill climbs and statium things take about 30 seconds to complete !!!! Don`t buy it!!! Beach Buggy is far more superior than this !!! Anyone remember Monster Truck Madness for N64? There was a power up that made your truck fly, spent way too much time trying to cheese the game and clip through objects with that one. But the best mode was royal rumble or whatever it was called... It was basically Monkey Fight from SMB where you had to ram your buddies off a platform and stay up there the longest. Cool game. I might have been interested if it had some kind of destruction mode, where you try to cause the most dollars in damage in a area. I mean, come on? What else are you suppose to do with monster trucks, than destroy everything? It looks kinda cool but what exactly is the point of the game? Do you just drive over some bumpy roads and win? Is it a race? Do I do kick flips with the trucks? Looks like it should be a $9.99 download... there is potential for fun here, but it looks like they missed on this one. Yep, way overpriced for what it is . if it was under $20 I would have considered it as there's some fun to be had with these kind of games but as it is, not a chance. I reckon this will be lucky to reach 4 figures in sales.